(paperback, 6″x9″, 321pp) Only $9.95+ $2.75 shipping anywhere in the USA. Other shipping options available at final checkout, including worldwide. (See this page to order the hardcopy book directly from Mt. Sneffels Press. Also, Book 2 is now available on Kindle for 99 cents!) A special note: The Missing Wand is dedicated to Caroline Stoufer, the late owner of Buckskin Booksellers in Ouray, Colorado. Watch author Dave Casler read from Book 2.
at the bottom right and choose HQ. Book 2: The Missing Wand picks up right where Book 1: Genesis leaves off. The ability to fly broomsticks has been given away and the phenomenon is catching on. Broom clubs are springing up everywhere, even in Swaziland! We catch Dave as he begins to grapple with problems uncovered because of the “technology” release. First, there’s the issue of safety. Since a rider’s center of gravity is above the broomstick, one can flip upside down rather easily, and grabbing onto the broom for support simply tells it to zoom to the ground. Riders must wear proper safety harnesses to keep them attached to the broom and must remember to let go of the broom’s control area if they flip. A number of (rash) folks made broomsticks and ended up exiting the gene pool because they failed to observe these precautions. Dave makes the analogy that cars, motorcycles, and airplanes are also great ways to kill yourself if not used properly; the same is true of brooms. This problem seems unimportant (though annoying) at first, since Dave can make another wand from his original and figures only FOG members can use wands. When this proves to be an invalid assumption, the search for the missing wand becomes incredibly important. Third, there’s the little matter of the Federal Aviation Administration. The FAA is quite convinced they own all the airspace from your roof to the moon and flying broomsticks encroach upon this sacred territory. Things are merely uneasy until a couple errant broomsters nearly take down a 747; things turn ugly after that. And broomsters simply won’t put up with a blanket federal ban. Much of the story centers around a teen named Chappie, a downtrodden fellow with a brilliant academic record and no self esteem. He meets a broomstick (much against his will) and finds his life changed. And Dan, the indefatigable newsman from Grand Junction, is still hot on Dave’s trail, refusing to believe that wands are real or that there’s anything behind the broomstick other than unrevealed technology cooked up in Dave’s basement. Of course, the Three on a Broomstick crowd make a reappearance, this time in Colorado! Dave convinces them that the penultimate movie needs some real (as opposed to CGI) flying scenes filmed at Lizard Head Pass near Telluride. But filming three teen movie stars flying broomsticks turns out to be far more complicated than anyone would imagine. 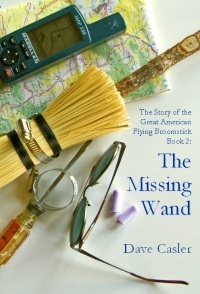 Book 2: The Missing Wand is about the flying broomstick, of course, with enough flight (and chase) scenes for everyone. But moreso it’s about the wand. To recover the missing wand, Dave needs to learn how to make one wand find another. And in some rather dangerous situations, he learns to program his wand “on the fly” so to speak, which backfires rather spectacularly later. If you loved Book 1: Genesis (and everyone who has read it tells me it’s fantastic), then you’ll love Book 2: The Missing Wand! It further develops themes explored in Book 1: Genesis and expands them, adding new themes as well. Order your copy today!